At least the stem blockage from this estate off of eBay is removed. And it’ll get a new stem. Not long ago, I obtained my very 1st Meer and like it quite a bit. Clearly, the response the OP was hoping for. 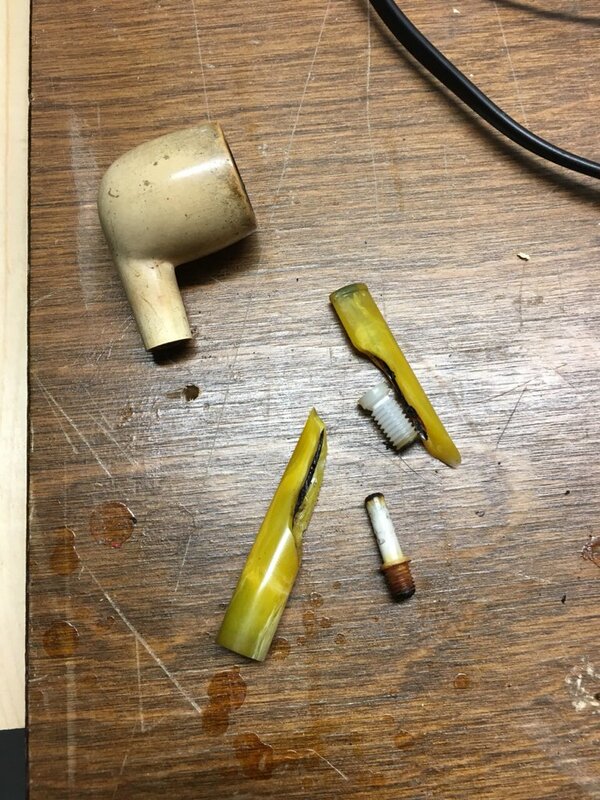 Upon seeing his newly broken pipe,I’m sure he immediately posted here to see if Goose had a meerschaum and whether that meerschaum had the Goose Seal of Approval. I agree with you that Ryland chose his words poorly in not asking you at all whether you owned or enjoyed a meerschaum, but we can only surmise that this mistake was caused by shyness, as it is immediately obvious that anyone posting about their broken pipe is really appealing for your opinions on the pipe material’s smoking qualities. 1. Who made your meerschaumm. 2. What are the opinions of your chartreuse cat, Lucy, regarding meerschaum pipes in general and Bekler’s in particular. That stinks, bud. What's your plan for fixing it? Who, what, where, etc. I've never had to have a meer repaired. Nope. Didn't miss this guy one bit. I'm not 100% sure yet. I got it for close to nothing so I'm not out too much. At that price I can't afford not to. It's a stewardship issue. I've gotten into meerschaums a bit, and I hate to tell you this but they are not easy to repair. Many repair shops wont touch them. If you have to go the repair route, I'd look at Briarworks. They're the best. Otherwise I'd either try to buy a job lot of meerschaum stems on Ebay or junk the pipe. Sorry, sir, and good luck. So sorry to see that. I can honestly say I've been there and done that. Good luck finding a new stem.